This product requires the base game Neon Chrome. This content requires the base game Neon Chrome on Steam in order to play. 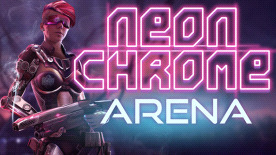 Neon Chrome - Arena is a an arena type survival game mode with leaderboards. Your goal is to survive as long as possible using any means necessary. Endless streams of enemies will eventually end your fight. How high can you score before your demise? Install up to 12 enhancements during your run. After launch we'll make balancing updates and issue fixes after we've gathered some feedback. After that the development plans depend on the popularity of the DLC. Neon Chrome - Arena is currently available only for Windows. Linux and Mac support will be added at a later date.